This DigitalGlobe satellite image shows Punggye-ri, a site of apparent activity in North Korea. Some experts believe Punggye-ri is a nuclear test site, but that claim is under dispute. This photo is one of a series of Punggye-ri images that have been analyzed by the company Spaceknow. A suspected nuclear test facility in North Korea shows what appears to be substantial changes over the past few years, a recent analysis of satellite imagery suggests, according to some experts. "You are seeing construction activity at the entrance to the test tunnel at the Punggye-ri ... test site, where the bomb was detonated as recorded by the earthquake [tracked] by the U.S. Geological Survey," Pavel Machalek, CEO of Spaceknow, told Space.com via email. "It is not immediately clear what the site is, and the images are only helpful in context." As of last night (Jan. 7), the Obama administration is considering further sanctions against North Korea following the reported Wednesday test, according to the Wall Street Journal. The United States has no diplomatic relations with North Korea and already has economic restrictions in place, such as blocking imports to the country and the property rights of certain individuals. In a recent statement, the United Nations also said it may implement "significant measures" against the Asian country, an autocratic state that has long been seeking to develop nuclear weapons. Machalek cited a Dec. 31 report by British newspaper The Telegraph quoting 38 North, a website that keeps tabs on North Korea and its activities. On Dec. 30, 38 North published DigitalGlobe imagery from Dec. 12 showing what appears to be a mining cart track and signs of excavation after an earlier claim by North Korea related to its hydrogen bomb project. At the time, 38 North, however, could not specify what the excavation was for. Last month, a report from the news agency Reuters said that U.S. officials were skeptical of North Korea's hydrogen-bomb claims. Hydrogen bombs are much more powerful than atomic bombs (a different type of nuclear bomb) and, therefore, would have set off a larger seismic wave, scientists said Wednesday, according to Live Science. "At this point, the information that we have access to calls into serious question those claims," White House spokesman Josh Earnest said, according to the Reuters report. "But we take very seriously the risk and the threat that is posed by the North Korean regime in their ambitions to develop a nuclear weapon." The fact that the Punggye-ri site is underground makes it challenging to determine if there was, indeed, an H-bomb test at the site, Machalek said. Usually, an underground explosion leaves "no visible marks on the surface," he said. Machalek cited a recent Wired article that discussed analyzing radiation and seismic waves to determine the type of explosion. This sort of analysis takes time to perform. 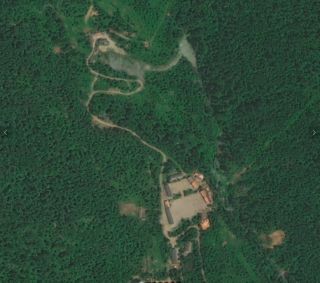 This later DigitalGlobe image shows modifications to the Punggye-ri site in North Korea. In January 2016, significant seismic activity was recorded in North Korea. Some experts, but not all, say that it could have been a result of nuclear testing at this site. This photo is one of a series of Punggye-ri images that have been analyzed by the company Spaceknow. An explosion, the Wired article added, produces compressions that would appear on seismographs as something called a P-wave. Earthquakes usually occur when rocky plates move against each other; the shearing produces what is known as an S-wave. However, depending on the type of rock, the signal can get distorted, and it can be difficult to say definitively if it is a P-wave or an S-wave. This is why experts usually try to get readings from multiple earthquake sensors, Wired reported. The North Korea site analysis from Spaceknow is similar to other projects the company has performed. Examples include monitoring the construction of the new Apple campus in Cupertino, California, and progress on salvaging the wreckage of the Costa Concordia, a cruise ship that sank off the Italian coast in late 2012. Most of Spaceknow's work is for financial clients who want to track large economic projects such as multiple factories, mines and ports. The public can also access analytics using a beta website.